Well, wha’ d’ ya know? Godot is actually here in the form of some sunnier, drier weather. The wind is still with us but we beggars won’t be choosers and we’re very relieved. All our fellow campers look much relieved, too. I’m sure, also, that the locals are feeling a little relieved that their uncharacteristically long run of unsettled meteo seems to be changing. Nature is also much relieved. This site is one of the richest Francine and I know for wildlife and the business of eating and mating has been on hold for the last few days in the wind and rain. Now that Godot is here again, not only are all the campers emerging but so is nature. Once again dragonflies and damselflies are buzzing about over the lake beside which we are camped. 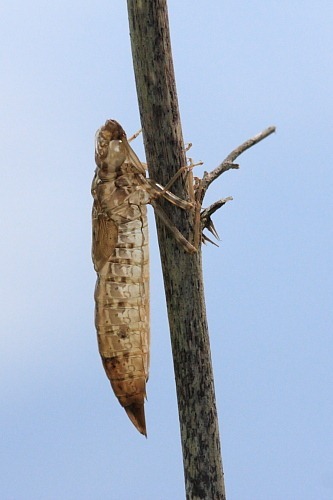 A quick walk along the margins of the lake revealed several dragonfly exuviae, the husks remaining after their transformation into adults. 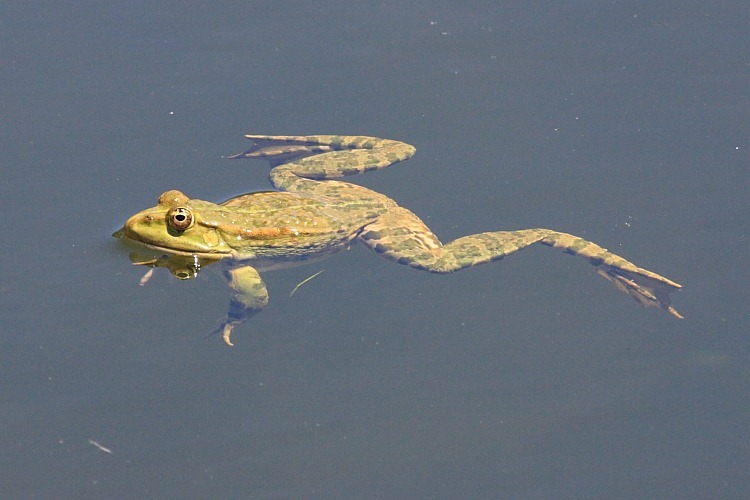 The lake is swarming with frogs which are once again basking in the shallows soaking up some sun. The lake is actually pretty much overrun with frogs and, throughout the entire night time, there is a ceaseless cacophony of their croaking. Francine and I love it. The raucous noise is so constant that we can push it into the background and sleep, listening only when we want to. Not everyone is quite so keen on it, though. We have known campers be driven to distraction by the frogs’ noise, shutting down all ventilation in an attempt to deaden the din. With the cooler weather, the frogs have actually been noisy during the day, as well. Their calling is apparently heat related, the daytime racket lessening as the temperatures increase. The more observant campers rightly become slightly curious when noticing that some croaking is not actually emanating from the lake. Some of the noises seem to be coming from the trees. 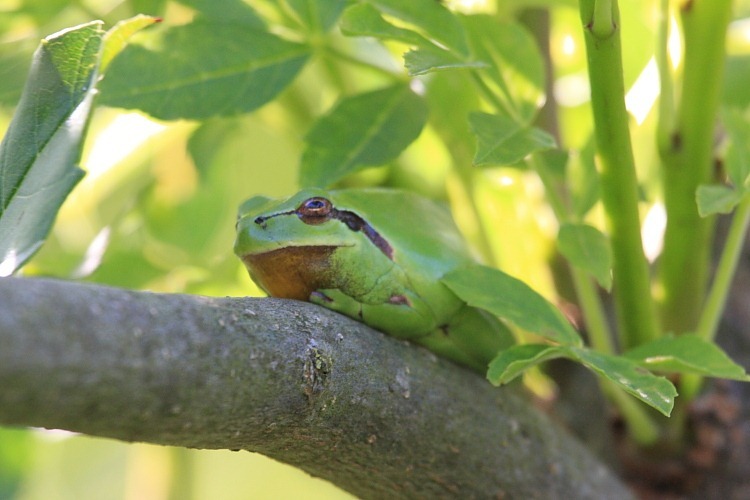 The culprits are painfully cute, bright green tree frogs which, with a little patience, keen pairs of ears and eyes might track down. I’m used to tree frogs featuring in wildlife programs based in a jungle but here they are enjoying a spot of southern France. Marcel (local farmer senior) tells us that the weather should be good until at least the weekend. Let’s hope he’s right. If so, the wildlife situation can only improve.